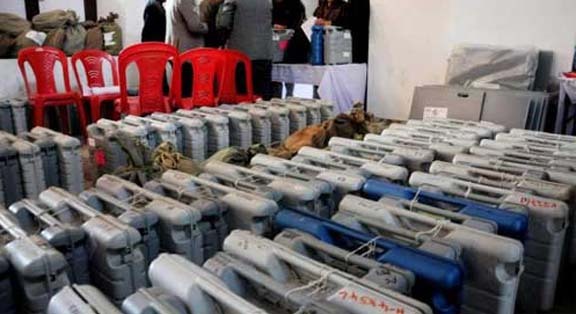 The sealed EVMs collected from 265 polling stations located across seven Assembly constituencies under Outer Manipur Parliamentary constituency, that went to poll on April 11, have been stored in a strong room under tight security at Mini Secretariat of Thoubal district. According to official sources, the EVM machines were brought to the Thoubal district headquarters, 35 km south of Imphal safely on late Thursday evening, sources said. Expressing her happiness at safe arrival of all polling/security personnel engaged in election duty in the seven Assembly constituencies with EVM machines, deputy commissioner Haobam Rosita of Thoubal, who is also the district election officer said, all had been put in place to ensure proper security of the EVM machines in the strong room. According to the election office at Thoubal, overall poll percentage of the seven Assembly constituency is 76.98. The voter turnout in the Heirok Assembly constituency is 85.43%, Wangjing Tentha is 74.07%, Khangabok 84.21%, Wabagai 79.73%, Kakching 68.16%, Hiyanglam 73.99% and Sugnu is 73.27%. Except some polling stations, most of the sealed EVMs reportedly arrived at the respective district headquarters, sources said. Manipur has recorded nearly 80 per cent polling in the first phase in Outer Manipur parliamentary constituency. Meanwhile, the chief electoral officer of Manipur, PK Singh, when sought information relating to announcement of re-polling, said the scrutiny for the polling stations where re-poll might be held will be done on April 14 and the report will be sent to the Election Commission of India which will later fix the date of repolling. There are reports of destroying EVMs and VVPATs at two polling stations at Poi, a remote village near Indo-Myanmar border during Thursday’s polling. In another development, the district election officer in association with Nehru Yuva Kendra of Bishnupur organized a stand-up comedy show on Ethical and Informed Voting and Mass Electoral Participation as a part of Systematic Voters’ Education and Electoral Participation activity at Thanga Public Ground on Friday. On the occasion, the general public formed a human chain in the form of India map with the words ‘VOTE’ and ‘LSE 2019’ with Election Commission of India logo inside the map. The participants were entertained by comedians from “Nokphade”. The group highlighted the importance of ethical and informed voting in a comical way for better understanding.